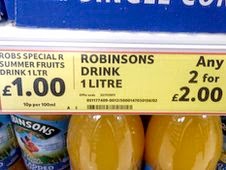 Wimbledon starts today so I'm inspired to buy some refreshing Robinsons drinks. Unfortunately, Tesco has seen me coming. In fact, game, set and match to Tesco. Every time.